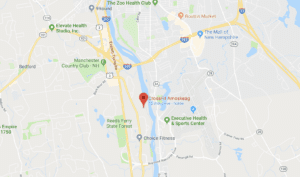 Grab your kids and join CrossFit Amoskeag for some fun running, swimming, and biking! What Is The Kid’s Try-athlon? Swim, bike, run, fun! We are proud to announce that we will be a sponsor at the 6th Annual Kid’s Try-Athlon. Registration is open for the Try-athlon and we have 10 free registrations for team Crossfit Amoskeag. It is a fun race for all kids ages 4 to 15, no matter their athletic ability. Crossfit is all about having fun, pushing our athletic abilities, and comradery and that is just what these kids will be doing that day – and all for a great cause! If you are not already familiar with this local charity, Friends of Aine is a non-profit established to provide bereavement support services to grieving children and families. Borne out of the tragic loss of Aine Marie Phillips (pronounced Ahn-ya) at age 8, and the recognition that bereavement services for Aine’s surviving 5-year-old sister, Bella, were sadly scarce, parents David and Christine set out to fill this void. Friends of Aine was developed to create an enduring legacy for Aine that embodies her spirit and character by helping children and their families who are grieving the loss of a sibling or parent. Aine loved to be outside doing things. In the winter time she was crazy for sledding and in summer she turned into a fish (when she wasn’t riding her bike or running around with her friends). 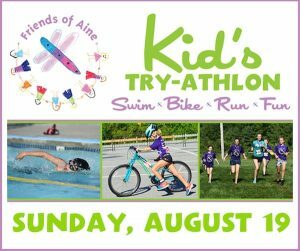 The Kid’s Try-athlon encompasses the 3 things Aine loved to do all summer: swim, bike and run!. It is an opportunity for kids to experience a race without the pressures of worrying if they can make the distances or not – we’ve designed it so that everyone is triumphant! Crossfit Amoskeag is thrilled to be part of this wonderful day and cause with local friends and families. Have your children join us for this fun event and join the Crossfit Amoskeag Team! We will see you for the swim, bike, run! To learn more about CrossFit Amoskeag please fill out the form below and we will be in touch shortly.